I'm researching whether I should get an i5 or i7 CPU for my next gaming machine. The consensus seems to be that hyperthreading makes very little difference, except for situations where CPU calculations are very intense (massive online multiplayer games like Battlefield 3 and maybe strategy games that support HT). I can afford to buy the i7, but I'd rather have a cooler machine. Right now, I'm pretty set on getting a high-end iMac, where you can't turn off hyperthreading or overclock (no bios). This stutter issue many are talking about (in Battlefield 3, but also several other games). Is the stuttering issue also present with hyperthreading CPUs at stock speeds, or is it a problem only with overclocking (and added stress to the CPU)? I would greatly appreciate some advice, if anyone here has any knowledge of these issues. Thanks for reading. The issue at hand isn't whether you will the Core i7/i5 or the heat. This shouldn't be a concern since you're set on getting a Mac which has probably zero chances of being overclocked and cooling fans and heatsink is designed to never overheat under normal operating conditions. The iMac or most Macs just aren't built to play very graphically intensive games. Yep, that's why I'm concerned with CPU heat under gaming... Any information around questions would be greatly appreciated. Thanks! The i5 is absolutely enough just for gaming, chances are it will never bottleneck whatever graphics card that Mac come with. In fact I wouldn't get a Mac for a gaming machine, unless you also want one for other reasons. Thanks, the new iMac comes with Geforce 680MX, it's a downclocked desktop 680 card, which makes 680MX the most powerful mobile graphics card available right now. I've seen that hyperthreading can make a difference in some cases (online playing etc. ), so I could go for the i7, but I'm worried about heat. I've seen a lot of reports of hyperthreading giving 10 extra degrees celsius, but that's from people with overclocked CPUs. Is hyperthreading making the i7 run hotter at stock speeds while gaming? For a gaming system you want to get Intel® Core&#8482; i5-3570K. The reason doesnt have anything to do with temperatures but it has everything to do with paying for something you won't be using. Right now very few games will use more than 4 threads for this reason the hyper-threading on the Intel Core i7 processor will only have minimal value in a gaming system. So when you can save $100 and get almost the same performance before you even think of overclocking sounds like a good deal. So go with the Intel Core i5-3570K. For a gaming system you want to get Intel® Core i5-3570K. The reason doesnt have anything to do with temperatures but it has everything to do with paying for something you won't be using. Right now very few games will use more than 4 threads for this reason the hyper-threading on the Intel Core i7 processor will only have minimal value in a gaming system. So when you can save $100 and get almost the same performance before you even think of overclocking sounds like a good deal. So go with the Intel Core i5-3570K. If he's customizing his iMac from Apple's main site, the difference is $200 and he is not getting a "K" processor. When did the 680MX come out? Looks like a beast of a mobile GPU. Thanks for the replies! Yes, I'm getting a mac.. I spend most of my time doing office work, email, browsing, watching movies, Spotify and WiMP, some orchestral scoring/composing in Sibelius etc. I'm gonna get 16gb ram, 768 ssd and 680mx gfx card, so this iMac is going to really, really expensive. And it's easy to feel like you should just max out the CPU also, since you're already paying big bucks. I've also gotten interesting in gaming again (typically story driven action games and fps shooters), and would like to be able to use bootcamp and play some games 2-3 times a week in Windows 7. Anyway, my thought was the i7 can make some difference in a few games, but I don't want to have that occational small improvement at the expense of a hotter and more noisy iMac. Anyway.. long story short, any experiences with trying hypertreadhing on vs. off on a non-overclocked CPU? Does hyperthreading make for a hotter CPU when using stock speeds? Temperature only increases with HT enabled if the HT circuits themselves are being used and performing calculations. I just want to point out that basically you are asking if people with HT actually run programs that use HT, because if they don't then of course the processor won't be any warmer. If you run a program that uses HT then yes, temperatures will be higher because the CPU (thanks to HT) is doing more work per second. The question you have to ask yourself is - will my apps have higher performance if I have an HT processor than a non-HT processor? If the sole objective is to have a low-temperature processor, without taking performance into account, then you could attain that goal by buying the lowest clockspeed rated sandy-bridge processor you can find. Will run nice and cool, performance won't be great though. HT processors only run warmer than non-HT processors if the HT processor is doing more computations than the non-HT processor, and if it is doing more computations then that is presumably a good thing because it means your HT-enabled processor is going to be higher performing. Thanks for the reply. But if this is the case, why do overclockers disable hyperthreading to have less heat and reach higher speeds for gaming in general? Hyperthreading just tends to reduce the max overclocks people can achieve. I don't think it has much to do with heat. Thanks for the reply. But if this is the case, why do overclockers disable hyperthreading to have less heat and reach higher speeds? That is a select group of OC'ers who disable HT just to get a higher clockspeed. For OC'ers who are OC'ing with the purpose of increasing performance, they will HT enabled since HT is increasing performance. If HT wasn't increasing performance then it wouldn't increase temps either, it would actually decrease them. We see this with LinX for example. 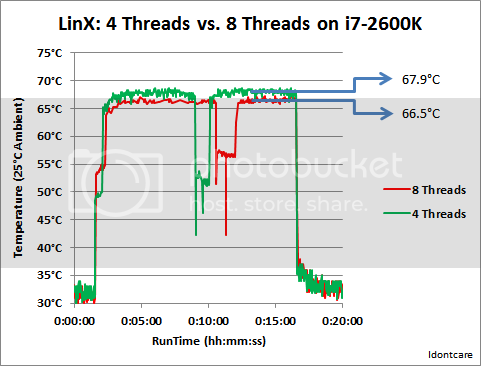 Using HT with LinX results in lower temperatures versus disabling HT (or manually avoiding putting threads on cores that would trigger HT to be used). Not everyone who OC's is overclocking for the sake of increasing performance. So you will come across cases where people are disabling HT (and entire cores even) just to eek out a little more clockspeed despite the fact that they are taking steps backwards in terms of overall performance. Thanks! Great info, appreciate it. However, I see lots of gamers are disabling hyperthreading because it produce stuttering in some games (like Battlefield 3). If I bought an iMac with i7, I have no option to turn off hyperthreading. However, it seems to me that almost every person complaining about stuttering and hyperthreading have overclocked their computer quite a bit. Is this hyperthreading stuttering connected specifically with overclocking? HyperThreading and more heat is easily tangible in Pentium 4 processors, but the "Bridge" architectures are a completely different animal. I doubt it's going to be a major issue. thanks, I made a mistake on my post, my intention was to tell exactly that, it uses more power with HT, even if it's "slower", using it. Thanks for the comments! Well, I'm not obsessive about temperature, but it's different with the iMac. I would like to have it for at least 4 years, and too much heat is no good for longevity or could be bad for the screen. Also too much heat = lots of fan noise. Intel is dropping hyperthreading from i7 chips!